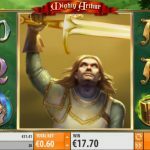 Mighty Arthur is a video slot game from Quickspin that was inspired by the very popular legend about the King Arthur and the Knights on the Round Table. There are many shows, movies and cartoons that take us back to Camelot to relieve the story one more time. Now we have the chance to do through this game. The game has a very attractive and soothing design with sound effects that complement the theme. Arthur and Merlin are the two symbols that can help you in many ways in this game. The Arthur Expanding wild appears on the third reel only, but when it does it will expand to adjacent reels making them wild too. The Merlin Random Wild is a 3×1 wild symbol. This symbol generates between 2 to 6 additional wilds on the reels and that way it helps you create more wins. The free spins feature is activated by landing 3 of the shield bonus symbols on the first, third and fifth reel. This is a very simple feature though, where you get 10 free spins. It is also possible to land additional free spins if you land 3 more scatter symbols. 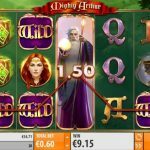 Mighty Arthur is a very powerful slot from Quickspin. We enjoyed playing this game and we loved every aspect of it. The design is superb and the game play is smooth. There are a couple of special features that make this game more interesting and fun to play. 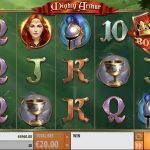 The betting options are also what make this slot attractive to players. Every kind of a player can find the right bet size for them, no matter whether they are low rollers or high rollers. We highly advise you to give this game a chance and we are sure you will love it. For n engaging slot taking you back to Mayan times consider playing Mayana a 5 reels slot by Quickspin.